Florida State University, Department of Mathematics. Previous semesters: Fall 2018, Spring 2018, Fall 2017, Spring 2017, Fall 2016, Spring 2016, Fall 2015, Spring 2015, Fall 2014, Spring 2014, Fall 2013, Spring 2013, Fall 2012, Spring 2012, Fall 2011, Spring 2011, Fall 2010, Spring 2010, Fall 2009, Spring 2009, Fall 2008, Spring 2008, Fall 2007 Spring 2007, Fall 2006, Spring 2006, Fall 2005, Spring 2005, Fall 2004, Spring 2004, Fall 2003, Spring 2003, Fall 2002, Spring 2002, Fall 2001, Spring 2001, Fall 2000, Spring 2000, Fall 1999, Spring 1999, Fall 1998, Spring 1998, Fall 1997. The image on the right is the singularity knot of the singularity at j=infinity of the modular curve X0(10), made with the plot_knot program in my Maple algcurves package. 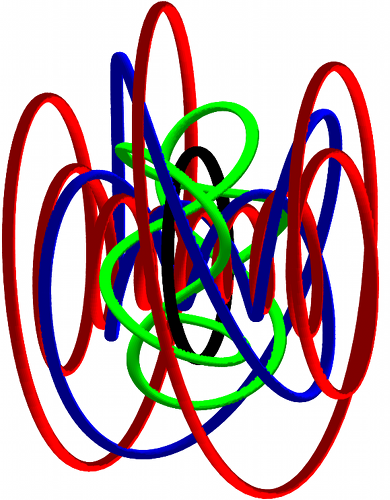 For more knots, including animations I made as a grad student on a 386-PC, click on: Math Art Gallery. Why I would not move to Mars.